Community Blog by coffeewithgames // Castlevania: The Adventure ReBirth - Hours spent in Transylvania? Castlevania: The Adventure ReBirth - Hours spent in Transylvania? Castlevania: The Adventure ReBirth released for Nintendo's WiiWare service on December 28, 2009 in the U.S., at 1,000 Wii Points (which is $10). The game was developed by M2 and published by Konami, and received an ESRB rating of "TEEN" with "Animated Blood, Fantasy Violence" listed as content for parents and gamers to be aware of. A brief description for the game on its Nintendo Channel page reads, "The classic Castlevania game is reborn for the Wii with all-new upgrades." How many U.S. Wii owners have reported playing Castlevania: The Adventure ReBirth, and how many hours have they reported playing it? Brew yourself some coffee, and let's take a look! 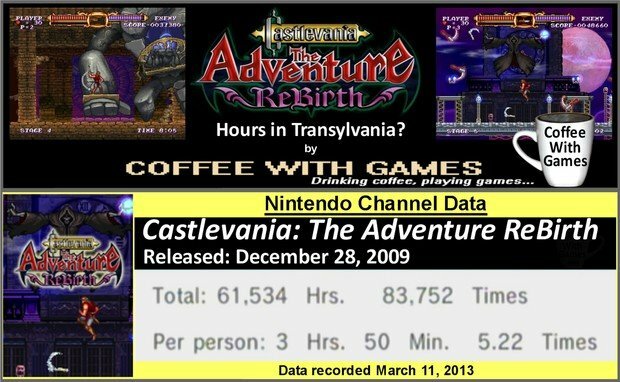 Castlevania: The Adventure ReBirth has approximately 16,044 U.S. Wii owners with gameplay data that has been reported through the Nintendo Channel. The game has just over 60,000 hours of gameplay reported, as the image shows, with 1,169 days possibly reported. The average reported play-time is 3 hours 50 minutes "Per person", which averages to be about 44 minutes played per day/session. The game has a "professional" critic review score average of 81.40%, based on 20 reviews on GameRankings.com. It has a customer review score, or "User Score", on MetaCritic.com of 9.3 out of 10, based on 31 ratings. Based on the approximate number of players with reported data and the game's $10 price point, Castlevania: The Adventure ReBirth's U.S. WiiWare release has made Konami about $160,440, since it released. I played either the original Castlevania or Super Castlevania IV at a cousin's house when I was younger, but not since then. I don't remember which game it was, but I do remember using the whip in the game, and I thought it was really cool at the time. While Castlevania: The Adventure ReBirth has a lower reported average played "Per person" than some other WiiWare games I have reported on before, I think it's interesting that Konami allowed M2 to remake the game for the WiiWare service. Why? Well, Konami had already released the original Castlevania through the Wii's Virtual Console service in 2007, and had a few other Castlevania games on the Virtual Console service as well. Apparently though, Nintendo fans are Castlevania fans, and Konami probably saw some early sales numbers from the Virtual Console Castlevania titles and thought a remake would do well on the WiiWare service. If you own a Wii or Wii U, and are interested in Castlevania: The Adventure ReBirth you can still purchase it through the Wii's Shop Channel under the WiiWare section. You can also find the original NES Castlevania and Castlevania II Simon's Quest games, and the SNES Super Castlevania IV, on the Virtual Console section of the Wii's Shop Channel. First, if you're a fan of the Castlevania games, do you have a favorite? If you have played Castlevania: The Adventure ReBirth, what did you think about the game? Was it a solid enough remake of the original, and worth its asking price? Also, while I may not own a Nintendo 3DS, I am aware of the new Castlevania game that released for it earlier this month, Lords of Shadow Mirror of Fate. If you have played it, what do you think about it?